Will you be loyal to the doctrine, discipline, and worship of Christ as this Church has received them? And will you, in accordance with the canons of this Church, obey your bishop and other ministers who may have authority over you and your work? I have already been living under this vow for 20 years as an ordained deacon in the Episcopal Church, but I have been invited to reflect on it again as I prepare for ordination to the priesthood. First and foremost, I believe the center of this particular vow – in response to the bishop’s questions about loyalty and obedience – is the promise to engage to conform. Doctrine, discipline, and worship may be the legal matter of this vow, but conforming (both willingly and readily) is the spiritual energy of this promise made by bishops, priests, and deacons at their ordination. We live in a culture that does not value conformity, but rather tries to sell us on the endless allure of newness, entrepreneurialism, start-ups, and fashion. Being transformed away from that culture, away from conformity to that world, means the “renewing of our minds” toward the good, the acceptable, the perfect. Being transformed toward good requires the paradoxical conformity of humility. Humility means learning the hard lesson that there are people who know more, and know better, than I do. As I have realized often in my professional career and in 20 years as a deacon (and more recently in three years of recovery), I can learn from the experiences of people who know what I need to know only to the extent that I am willing and ready to conform to “the steps we took, which are suggested as a program of recovery,” or to the experience of my colleagues, or to the practice of the Church’s disciplines. The church’s disciplines are not random, but have organic beginnings in the early Church and have developed over time as society has changed. In our particular branch of the Church, we have disciplines that include organizing ourselves in General Convention and dioceses and parishes, agreeing how we will worship (down to the fine print), and setting out requirements for ordaining bishops, priests, and deacons. Engaging to conform to the discipline of the Church means willingly working within the political structures of General Convention, the diocese, and the parish – even if you are working ultimately to change those structures. It means willingly observing the fine print of the prayer book or other services authorized by Convention, whether you agree with the changes or not. I’ve always worked in large, bureaucratic organizations, so I’m perfectly comfortable with the fact that there are policies and procedures – disciplines – that govern the way we live, and work, and worship together. Together or alone, we Episcopalians worship God the Father, through the Holy Spirit, in the Name of Jesus Christ. In just the same way as the disciplines of the Church have changed over time, so too has the Church’s worship, whether personal devotions or corporate prayer. From the very basics – fasting and the Lord’s Prayer – to personal prayers several times a day, to gatherings of Christians morning and evening, to splendid Byzantine liturgies and daily Latin Masses, to monastic offices, to worship in the vernacular and the Reformation focus on the reading of Scripture, the Church’s worship has changed and evolved in myriad ways throughout the 20 centuries since Jesus’ time. Engaging to conform to the Church’s pattern of worship means, for me, praying “by the book” using the daily offices of Morning and Evening Prayer. Though the public offering of the Daily Office has not been required of clergy in the American Episcopal Church as it was in England, it’s the heartbeat of the English prayer book tradition and an unparalleled practice for hearing and responding to the Holy Scriptures. Other forms of personal prayer, like meditation and Centering Prayer, supplement the offices and give me a chance to be silent and receptive, communing with God in that way. Secondly, even though for a long time Sunday worship in the English and American Church featured Morning Prayer and only occasional Communion, the pattern since 1979 (and in many places even before I was born) has been to celebrate the Holy Eucharist every Sunday and on other Major Feasts. The prayer book rubrics are clear on the subject. Engaging to conform, to my mind, means setting aside that kind of idiosyncratic preference in favor of practicing and promoting the Church’s current pattern of corporate worship. It’s often said (by Episcopalians, at least) that “praying shapes believing.” Practicing the Episcopal Church’s discipline and following the pattern of the Episcopal Church’s worship reveals the Episcopal Church’s doctrine. In the parishes and dioceses of the Episcopal Church we baptize new members of Christ’s body, making and renewing promises before God as we recite the Apostle’s Creed. We pray morning and evening, reading from the Holy Scriptures and reciting that same baptismal creed. We celebrate the Holy Eucharist every Sunday, reading from the Holy Scriptures and reciting the Nicene Creed in affirmation of the faith we hold. We confirm lay persons and marry people and ordain ministers in the context of the Holy Eucharist. In other sacramental rites, we reconcile the penitent, pronouncing on them God’s absolution; we minister to the sick, laying hands on them and anointing them with oil for healing; we bury the dead, commending them to God in the sure and certain hope of the Resurrection. Our doctrine is our common prayer, and it is to be found in its disciplines. My teaching over the years – in the catechumenate, in abuse prevention training, in Deacons’ School, in Episcopal 101, at retreats, on this blog, in Education for Ministry – has been, and will always be, rooted in the Book of Common Prayer and the Holy Scriptures, as the Episcopal Church uses them. I stand willing and ready once more to engage to conform. This entry was posted in Leadership, Ministry and tagged Book of Common Prayer, Daily Office, discipline, doctrine, Episcopal Church, Holy Eucharist, humility, ordination, sacramental rites, worship on September 26, 2016 by Rodger Patience. I’ve been reading Aldo Leopold’s classic of ecology and conservation A Sand County Almanac, and I just finished his biography A Fierce Green Fire by Marybeth Lorbiecki. 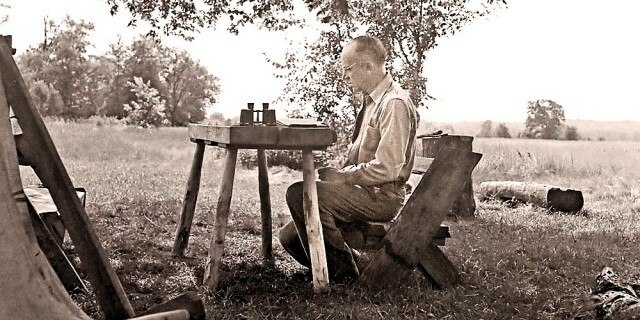 Aldo Leopold at “The Shack,” his family’s Sand County farm. In one particular passage, she recounts Leopold’s struggles to sway public opinion during the Wisconsin “deer crisis” of 1942. Leopold and other conservationists had become convinced that it was necessary to reverse the earlier practice of killing predators like wolves in order to “protect” species like deer. In fact, what Leopold had come to understand is that ecosystems or animals and plants depend upon the balance offered by predators and fire and other “dangers” — otherwise, species without predators or plants untouched by periodic fires overpopulate and damage the ecosystem themselves. So Leopold identified three groups of stakeholders: Group 1, the undecided; Group 2, supporters; and Group 3, the opposition. When I taught healthcare leaders as a member of the talent development faculty at the Advisory Board Company, we outlined an approach that included a stakeholder analysis just like Leopold’s and suggested three strategies to take for effective change leadership. Just as Leopold outlined, the first strategy is to move Supporters (his Group 2) from vague action to specific action. Give your supporters a schedule inviting them to act now. 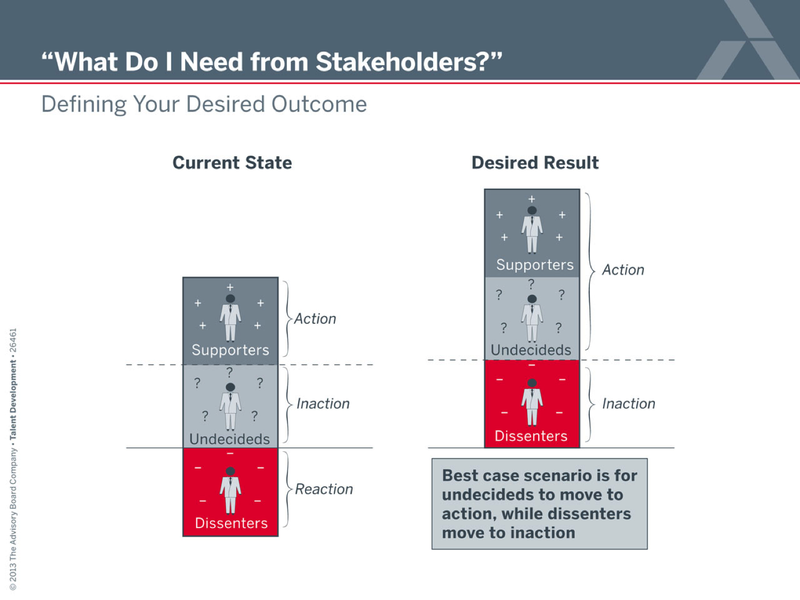 The second strategy is to move the Undecided (his Group 1) from inaction to action. Here, you must identify “what’s in it for me” — that is for each of them. Why should they join you? How will they benefit? And the third strategy, somewhat counter-intuitively, is to move the dissenters from active reaction against the change (“with mouth or pen,” as Leopold describes his Group 3) to passive inaction. It’s best if your opponents just do nothing and let the change proceed. As I know from being an Episcopal minister, the choir is already sitting up at the front of the church with us! Talking to our supporters is easy, because they agree with us, but it doesn’t necessarily move our change forward. In fact, our supporters may get tired of hearing us go on about the issue all the time, and we run the risk of alienating them. When we know we’re right, we often spend a lot of time trying to convince others that they’re wrong. The State Journal said of Leopold: “He, better than any other man in Wisconsin and probably better than any other man in the entire country, knows what real conservation is and how to achieve it” (Lorbiecki 162). However, Leopold came to see the wisdom of backing off from arguments lest his opponents’ charges of “Leopoldian egotism” prove true (Lorbiecki 163). Effective change leadership consists not necessarily in convincing opponents of the change that you are right, but of negating their inclination to act against the change. This calls for political savvy in addition to strong convictions. Sixty years on, we are still facing issues related to conservation; clearly, the changes Leopold identified as necessary take time to play out. Organizations, just like ecological communities, also tend to embrace change slowly. Even if change is effective, it is hard to sustain. It can be a challenge to teach new members of the group the hard-won wisdom gained in previous change efforts. Whether you are leading change in a large organization or a small volunteer group, you are pursuing complementary purposes. First, you must apply your leadership and political skill in the service of effectiveness — things must change, or you wouldn’t be leading the effort in the first place. Second, you are also helping make or preserve a “community instinct.” You must apply your passion and understanding to the people around you, seeing not only their utility, but also their beauty. People are part of any change, and the two cannot be separated. This entry was posted in Environment, Leadership and tagged Aldo Leopold, change, conservation, ecology, healthcare, leadership, stakeholder on June 4, 2015 by Rodger Patience. In these Instagram days, we love one-liners about important topics. But even more, we like cool pictures tagged #goals or #vision or #leadership. That sounds fantastic, doesn’t it? And the quote comes from the conductor of a symphony, so it’s a little artsy, too. Even better. Maybe a picture of a #sunset would make it more powerful? The real power of a vision comes when it is used, put into practice in specific ways in a particular organization by a certain group of people. Lofty visions and limited scope actually go hand in hand. Listen to entrepreneurs number 4 and 3 in this short video from GoToMeeting. Be precise … concentrate on your goals, what you want to achieve, and only on them. Prioritize your manpower appropriately. Don’t chase every single possible thing for your startup to do. Visions take form when we apply limits in order to clarify our focus, when we make choices about staffing and budgeting based on that vision, when we test and measure our success by the standard that our vision sets. 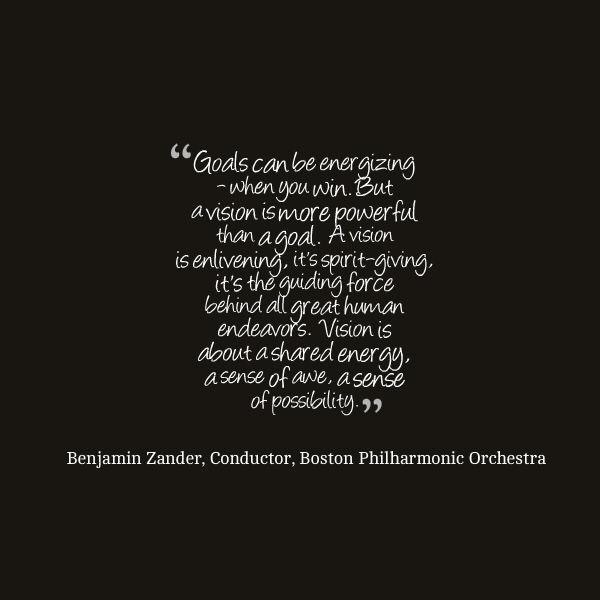 Visionary leaders are standard-bearers, constantly reminding their people not only of the lofty purpose but also of the limited scope and choices that entails. He might go on to add that we focused on Best Patient Care and Best People. Two sentences, two key concepts. Repeated every single time he spoke to anyone. It got so we could all repeat it, even if we had forgotten to wear our “Patients First” lapel pin to work that day. Visionary leaders are not only shaped by their learning (much of it coming from unglamorous, repetitious work) but are also creative in their practice. The creative fruit of leadership grows from seeds planted and watered, branches pruned and shaped steadily over time. So let the one-liners and the cool pictures lead you to wonder how you might put a lofty vision into practice. But learn from other visionary leaders about the concentration, discipline, and repetition that eventually bears fruit. This entry was posted in Leadership and tagged goals, leaders, limits, power, prioritize, purpose, scope, standard, vision, visionary leaders on May 29, 2015 by Rodger Patience.